Neutrogena, the skincare brand most recommended by dermatologists, is mounting its first ever run dubbed Chase the Sun: The Neutrogena Run, on Sunday, May 16, 2010 in Fort Bonifacio , Taguig City . Runners, both men and women, can register for the 3k, 5k, 10k, or 15k races at R.O.X. Bonifacio High Street , Planet Sports Trinoma, New Balance Glorietta and Shangri-la Mall and Athlete’s Foot Alabang Town Center until May 12. Registration fees are P400.00 for the 3k, P550.00 for the 5k, P600.00 for the 10k, and P650.00 for the 15k. 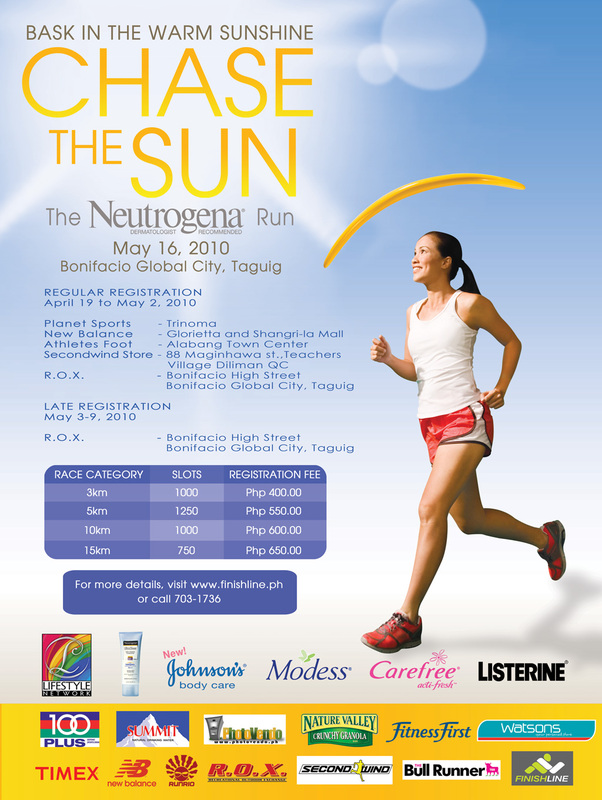 Armed with Neutrogena Ultra Sheer Dry Touch Sunblock SPF 50+ and Waterlight Lotion SPF 50+ PA+++, runners will finally get the chance to run under the summer sun with maximum sun protection. Filipino running icon, Coach Rio, and his team have taken the Chase the Sun Run to exciting new heights. Aside from the timer chip that every runner will receive, participants can look forward to new and exciting race routes. In addition to the Chase the Sun singlet, runners will receive a filled-to-the-brim Johnson & Johnson lootbag and an awesome finishers’ shirt made exclusively by Team Manila. Cash prizes also await the winners of each distance from the male and female categories. For an added treat, there will be numerous fun activities and games for the whole family sponsored by participating Johnson & Johnson brands: Carefree, Modess, Listerine, Johnson’s Body Care, and of course, Neutrogena. For more details, visit www.finishline.ph or call 703-1736.